Effective communication is what enables politicians to seek power on the pretext of making people’s lives better. The art of communicating a political message is undergoing rapid change as social media has eclipsed traditional ways of connecting with people on whose support political success depends. Gone are the days when politicians huddled on a cranky truck to preach their political message to a small crowd that did not need converting. The traditional printed media faces a similar challenge as online instant reporting by political events by news websites renders even the most accurate reporting out-of-date in an instant. Twitter, Instagram and Facebook are the preferred choices of most politicians even if many of them are still struggling to use these communications tools effectively. If I were to identify the politician that has mastered the social media to impress his followers, it must be Matteo Salvini, the Italian Deputy Prime Minister by title but the de facto decision maker in Italy’s coalition government. Salvini’s social media strategy is quite simple: project a soft image of his personal life and a macho political image of his political persona. While many politicians try to keep their personal lives out of their communication strategy, Salvini loves to project himself as the man of the people. This strategy is, of course, not new even if few politicians can manage to make it look genuine. Just try to count the times when we will see politicians hugging babies, embracing people with special needs, petting cute animals and attending church and civil functions frequented mostly by ordinary people. Salvini sells his common-man brand in a populist anti-elite era. His followers know that he likes Nutella on his morning bread as he often posts pictures of himself eating this spread on Facebook. Those who follow him also know that he likes Barilla pasta and a glass of Barolo like most ordinary Italians who rarely afford more sophisticated foods that are usually served in smart restaurants. The Italian Deputy Prime Minister is indeed a parable of the modern social media age. Like US President Donald Trump, he has turned the art of political communication on its head by using methods that have shattered political norms. Whether one agrees with Salvini’s message or not, one has to acknowledge that his mastery of modern communication has rocketed him from political obscurity to a position of substantial power in the European political scene. Salvini’s soft image of his personal life is counterbalanced by his macho political image. He achieves this not just by the harsh rhetoric he uses when attacking and blaming the Brussels bureaucracy for all that is failing in Italy, but also by appearing on live-streamed videos and political events wearing macho-man uniforms. While he aims to impress his followers that “he is just one of us” in his private life, his political message is that he is a no-nonsense leader that will defend the interest of ordinary people with little respect for tactical diplomacy when dealing with other traditional political leaders. When Salvini became the leader of La Lega in 2014, his party was polling about three per cent. 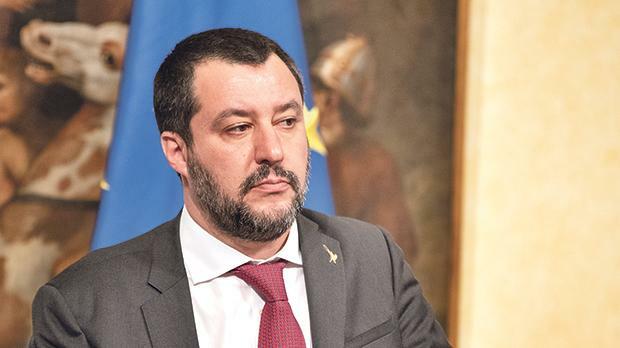 He soon adopted a very effective strategy when he instructed Luca Morisi, a software developer, with a brief to focus on Salvini, rather than a party-centred strategy, to establish a direct link with supporters. In a short period, Salvini made La Lega Italy’s major political party. He has 3.3 million followers on Facebook, more than a million followers on Instagram, and almost a million followers on Twitter. Many communication experts agree that Salvini had established an emotional link with his followers who see him as a man of the people. The videos used by Salvini on social media are purposely made to appear unprofessional. His message is never conciliatory and almost always polarising. However, it is often packaged as common sense solutions to Italy’s myriad problems. Salvini’s ability to combine inflammatory rhetoric with cheeriness confuses his political opponents. He managed to marginalise the once-promising socialist leader Matteo Renzi whose beaming smile never impressed the majority of Italian voters. Many ordinary Italians are convinced that Salvini wearing a firefighter jacket or holding a deep-fried rice ball in Catania just after the recent earthquake is a more genuine politician than those wearing designer clothes in Brussels or Rome. The real test for Salvini will come in the next several months when people will have to pass judgement on whether anti-establishment politicians offer more heat than light.